India to many is known as the vegetarian’s paradise. In a country where over 80% of the population follow a religion that supports vegetarianism, finding veg-friendly food here is not a problem. In fact, in India it is now illegal to consume beef. At first the vegan inside of me celebrated this small victory for cows, but I quickly came to learn that there was more to this ban that what meets the eye. Often people associate India with its holy cow. Tourist are excited for the moment they will see this animal roaming the roads. For generations, India has celebrated the cow because Hindus see it as an animal they should not eat, although this has not always been true. The Vedas, ancient Hindu texts, talk about how cattle meat should be prepared for both consumption and sacrifice. 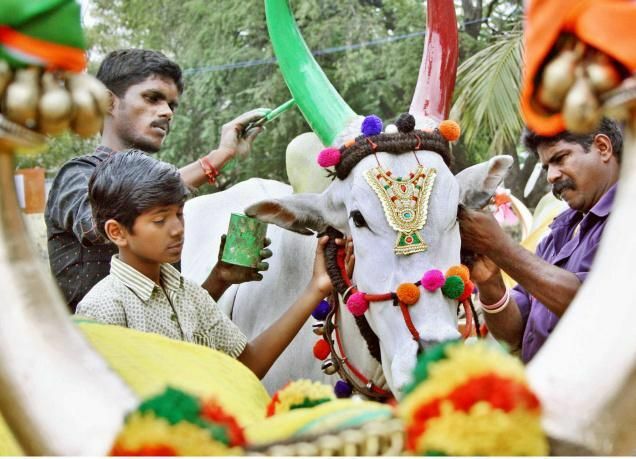 Fast forward a couple of thousand years to modern times where whole Hindu festivals, such as Pongal, are held in honor of the cow and how it has helped man work the fields. Respect for these animals is not only seen in religion, but it has been carried over into governmental issues. India’s constitution mandates that Indians must be compassionate towards animals. It is not specific to cows, but many people apply it more heavily to these animals. Although India’s constitution says this, the writings were never turned into rules and regulations. 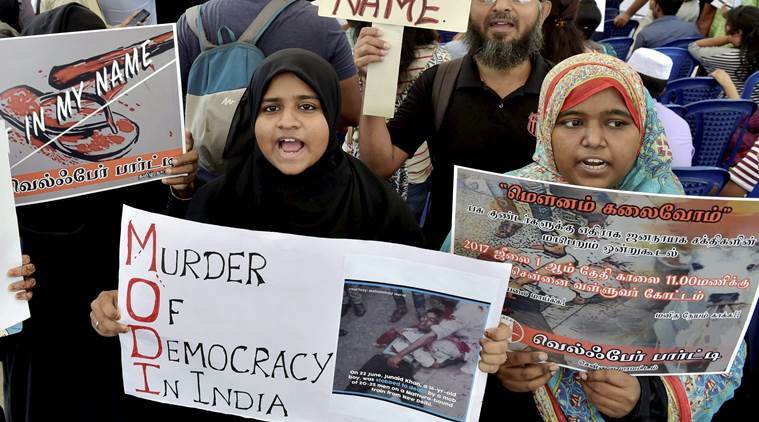 Recently these ideas were taken a step further when the BJP, the conservative Hindu party currently in power, implemented a ban on slaughter of cows and the consumption of their meat. While parts of the country rejoiced over this victory for their sacred animal, it put many others into crisis mode. Unlike in the US where steak is the food of the rich, beef in India is known as the food of the poor. High income and social status steers people away from this red meat. 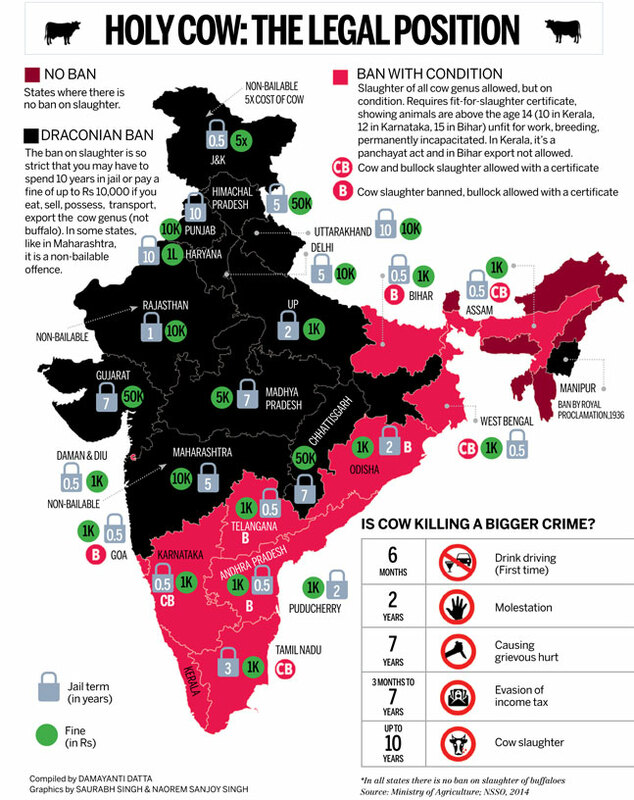 Due to the holy nature of cows in Hinduism, the beef ban mostly targets the Muslim community, adversely affecting their lifestyle. Muslims typically eat beef and this meat as a part of religious rituals, such as Eid al-Adha. The consumption of beef was known to a wider population of Indians during the pre-colonial period, only becoming taboo in the medieval period, after Mogul invasion. This issue became stronger in post colonial India when middle class Hindu’s used the banning of cow slaughter as a means to gain political power. Today more than ever, the levying of this strict beef ban has pinned Muslims and Hindus against each other. How is it right that a Hindu majority country bans the consumption of beef from its people yet they remain the third largest exporter of beef in the world? Interestingly enough of these industrial cattle slaughterhouses that are responsible for India’s export of beef are owned by Hindu families. So where is this disconnect? If India’s beef ban was really out of respect for their holiest animal, why does the government allow wealthy Hindu families to profit from their slaughter? In the opinion of many lecturers we have heard speak while in India, this new beef ban is a religious ploy to polarize the people of India. Violence has become wide spread; Hindu extremist take the lives of others in the name of the holy cow. It is not uncommon to read reports of lynchings that occurred because people were rummored to have consumed beef. India’s government even uses jobless youth to propagate the beef ban and enforce it. It is sad to hear the news of India’s government using religion as a means to polarize its people. Over the course of my time here, I have witnessed nothing but peace between these two faiths. While in Hyderabad Anant Maringanti, the founder of Hyderabad Urban Labs, spoke on the Hindu-Muslim interaction in the city. He talked about the history of their relations, revealing the longstanding mutual respect between the two religions. However Anant revealed that with the intolerant attitude displayed by the current Indian government, there has been a rise in animosity. It is still common to see people of different religious backgrounds attend other festivals, rituals and celebrations other than their own, showing the unity of these communities. It is only recent that tensions have heightened, leaving people to question wether they should continue to participate in these events associated with other faiths. I can only hope that these relationships built over time between people of different religions will not be torn apart by the evil intentions of an extreme government. Maringanti, Ananat (2017) Understanding urbanization from below. Lecture, Hyderabad Urban Labs. 22 September 2017. Gracey, Marilyn (2017) The Diversity of Indian Cultures and How they Perceive the Environment. Lecture, Madras Christian College International Guest House, 12 September 2017. Prabhakar, Lawrence (2017) India on the World Stage. Lecture, Madras Christian College International Guest House, 5 September 2017.